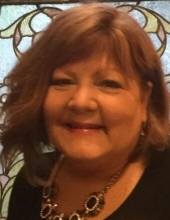 Karen Scherrer passed away peacefully to eternal life January 17, 2019 at her home in New Braunfels, TX. She is survived by her husband, Leo; son, Nathan (Brooke) Scherrer; daughter, Kerstin (Chip) Cooper and grandsons Chief, Odin, and Dax; mother, Dolores Brunner; sister, Nancy (Joe) Holcak; in-laws Henry (Judy) Scherrer; Mary (Frank) Kornberger; Paul (Carol) Scherrer; Carol (Mike, dec.) McCarty; Ella (Ron) Lipina and many nieces, nephews and great nieces and nephews. Karen was preceded in death by infant son, Ryan; loving father, Otto Brunner, Jr.; and in-laws, Henry and Viola Scherrer. She worked in Brazosport School District at Fleming Elementary, Beutel Elementary and Lanier Middle School. She moved to Smithville School District later in her career as Principal of Brown Primary School. Upon retirement, Karen became a Master Gardener for Comal County and in New Braunfels, a member of The Conservation Society, The Heritage Society, The German Society, and The New Braunfels Art League. Karen positively impacted many lives and was a joy to be around. If you heard excitement and laughter in a room full of people, more than likely Karen was in the middle of it. The family wishes to thank everyone for their love, prayers, kindness, and support. May God Bless Karen as she watches over us. Services will be held on January 26, 2019 at 3:00 pm at First United Methodist Church, 572 West San Antonio Street, New Braunfels, TX. In lieu of flowers, the family requests donations to the charity of your choice or to: The Heritage Society, 1370 Church Hill Drive, New Braunfels, TX 78130. To send flowers or a remembrance gift to the family of Karen Scherrer, please visit our Tribute Store. 572 W. San Antonio St.
"Email Address" would like to share the life celebration of Karen Scherrer. Click on the "link" to go to share a favorite memory or leave a condolence message for the family.